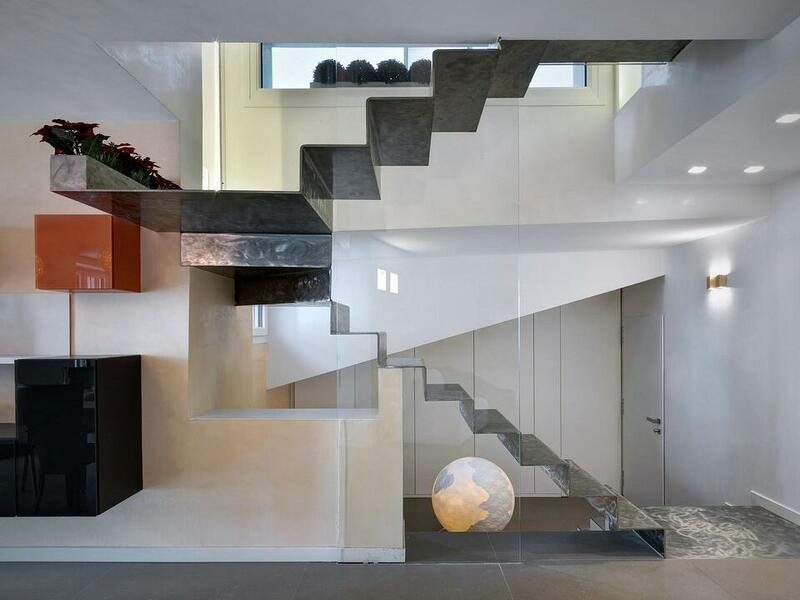 The internal staircases in private homes act as passage areas and connect the different floors of the house practically and functionally. Being able to move easily and fluidly from room to room both during the day and at night above all, is essential. This is why this space needs optimal brightness. Ensuring proper interior lighting design in an internal staircase is as important as giving light to the main rooms of the house. Designing this aspect in the best possible way for this area will ensure excellent visibility and comfort with every move. 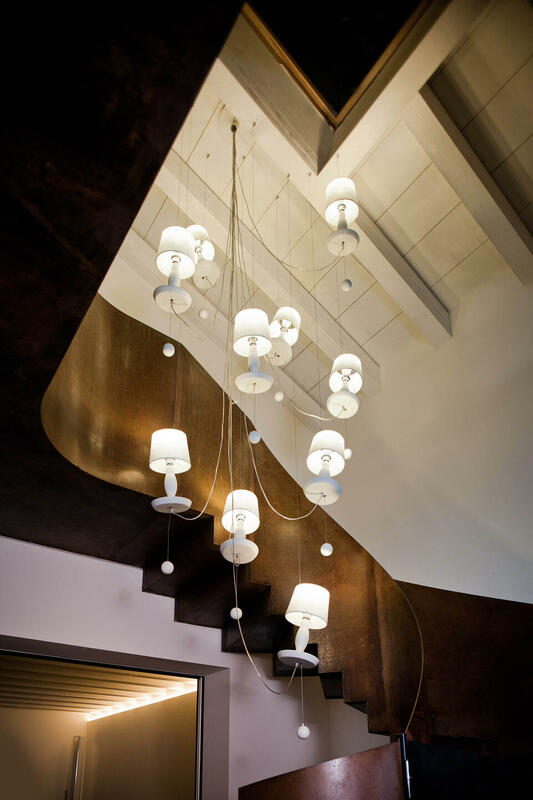 Let's find out how to illuminate an internal staircase correctly and which decorative lamps can add a touch of style. 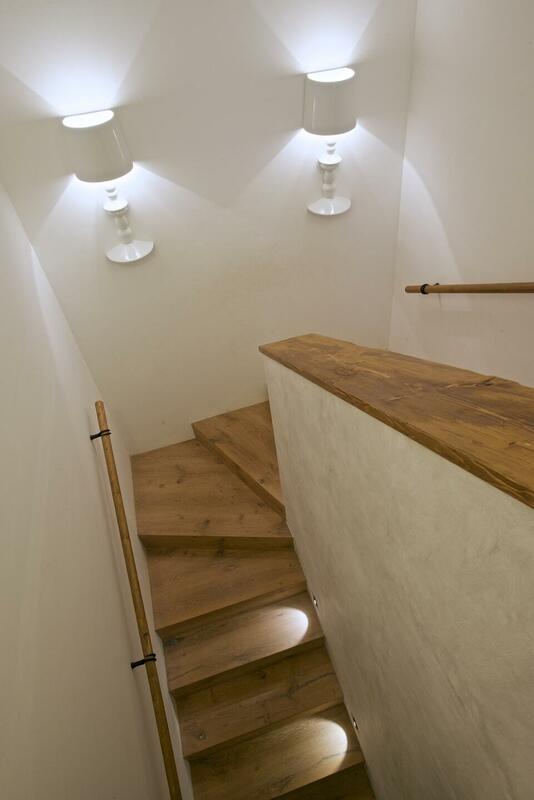 There are ideal lamp models and lighting levels for illuminating an internal staircase. Everything lies in knowing how to set the mood of this area and select the most suitable solutions. Below you will find valid suggestions to ensure proper lighting. Let's take a look at Alì e Babà, a designer appliqué made by Matteo Ugolini, ideal as a reference light point for any type of staircase. In this case, it is placed in a "U" staircase, uniformly illuminating the landing between the two ramps. Alì e Babà is as white as the walls that house it but still manages to stand out thanks to its well-defined silhouette and its glossy reflections of white glazed ceramic, a material that constitutes its entire structure. Two Cell suspensions illuminate an internal open staircase, shining in the centre of a high ceiling. The structure in white metal wire houses a linen shade that filters the light in a suffused way, giving the room streams of intense brightness. Silk tassel? A detail of unmistakable style that bears the signature of designer Matteo Ugolini. 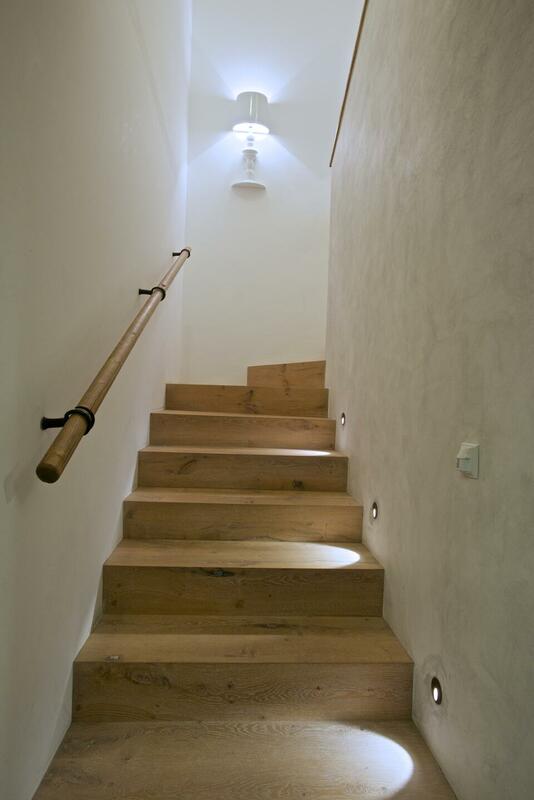 Another question that arises when asking how to illuminate an internal staircase is: lamps with warm or cold light? The choice depends as much on the atmosphere that you want to create as on the brightness of the environment. Intense white lights infuse a stimulating and energetic climate, while bright gleams tending towards orange and yellow make the atmosphere more intimate and comfortable. If the internal staircase is located at a specific point of the house where there are no windows or natural light sources, it is good to use direct and intense lighting sources. 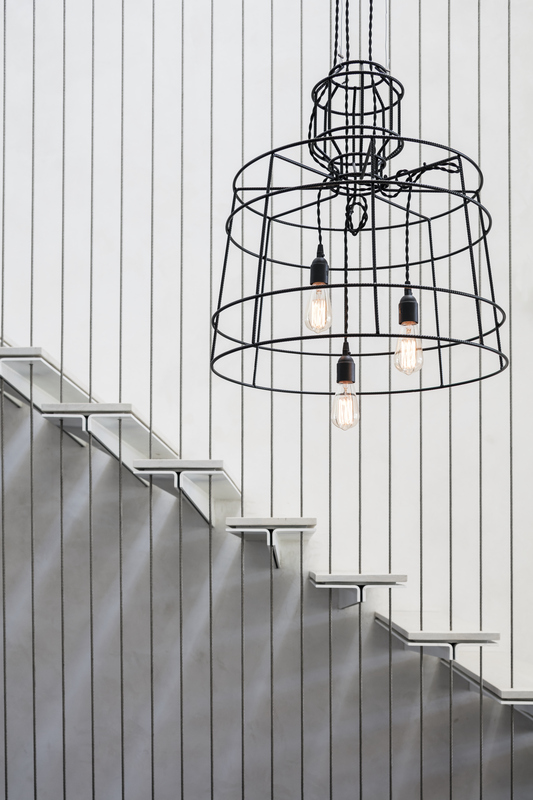 In this particular case, you could install suspension lamps along the staircase's path or place a single light point in the centre of the ceiling. A chandelier like Au Revoir, for example, could be the ideal solution. We are talking about a suspension lamp with an eclectic concept, designed by Matteo Ugolini, able to give light to the darkest spaces and revive the atmosphere. Its unusual and captivating shape moves towards a stylistic direction halfway between the old and the new. In fact, the opal white glass body and corolla-shaped lampshades evoke the image of the majestic chandeliers of the past. The details and the disjointed arrangement of the arms, on the contrary, are an authentic declaration of contemporary style. It is necessary to ensure excellent visibility in this important area of the house, but without blinding. Installing LED strips below the steps could be a good solution; the direct and well-distributed light highlights the surfaces without bothering the eye. Otherwise, you could place appliqué lamps along the wall. Wall lamps are excellent sources of task lighting and indirect light. 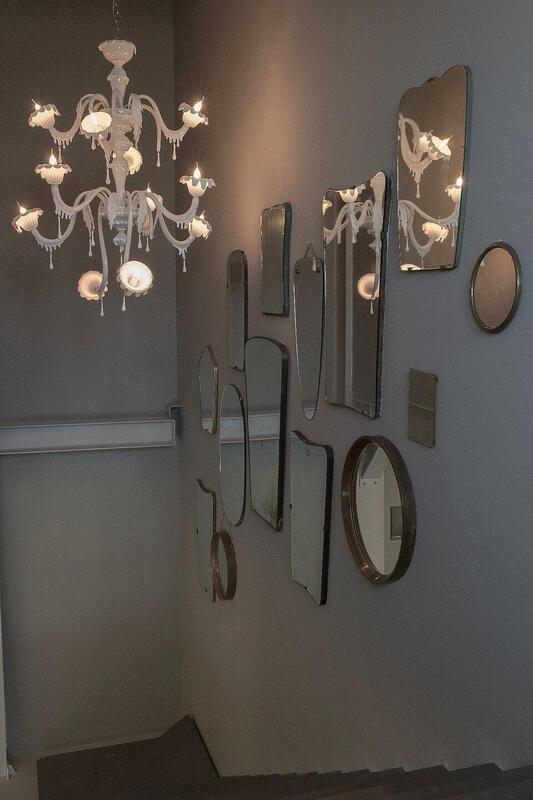 Moreover, they decorate the spaces like original design accessories and add a glamorous note. Déjà-Vu, an appliqué designed by Matteo Ugolini, wears white with refinement. It is a lamp with a curvilinear silhouette, decorated with bas-relief floral motifs and a linen shade for diffused and pleasant lighting. 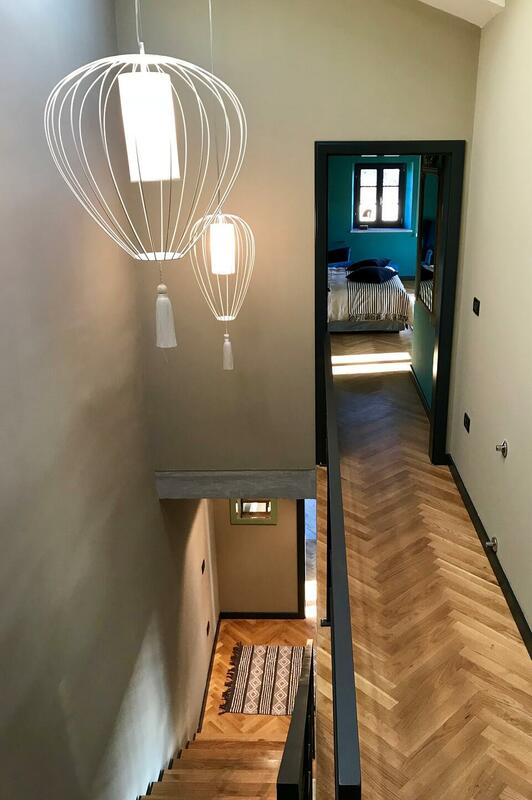 To achieve an aesthetically pleasing result, we recommend combining the model and design of the lamps with the materials that make up the staircase. In this way, you will give character to the spaces. The total white look of Norma M matches perfectly with any material and enhances its aesthetic appeal. It is an appliqué, designed by Edmondo Testaguzza, with a matte white ceramic structure and a white linen shade that allows a soft diffusion of light into the environment. Don't worry. There are appropriate solutions to illuminate the part below the stairs. For a staircase with an open upright, opt for standard lamps, while for stairs with a closed upright we recommend floor lamps. However, both models are confirmed as excellent sources of accent lighting and ideal furnishing elements. To create a focal point under the ramp choose a lamp like Ululì Ululà; it is a spherical fibreglass lamp enriched with lace inserts, created by Matteo Ugolini. A design solution with great decorative potential that provides soft and filtered light to the spaces. 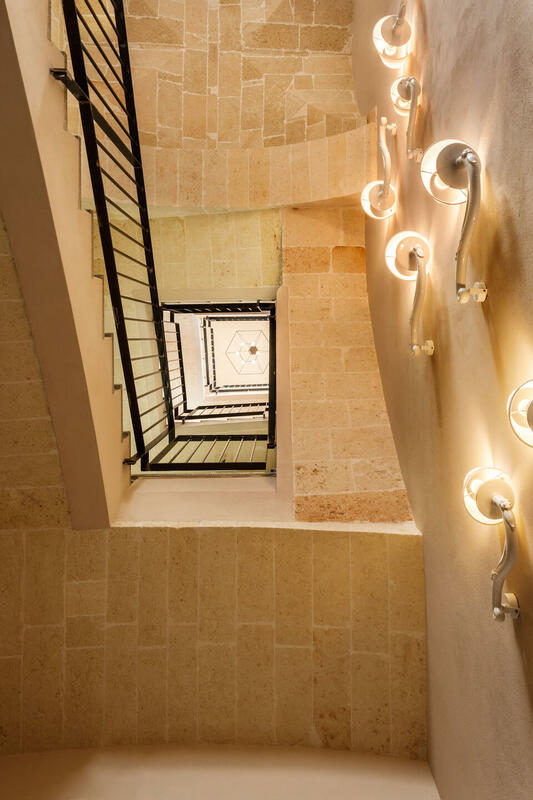 As we have already said, it is important that the internal staircase of a private house enjoys functional lighting, just like any other room in the house. But in addition to the practical aspect, it is necessary to give the right attention to the aesthetic character of the lighting sources. This is because giving character to even the most unexpected corners with a touch of style will make the entire home a personalised place, defined in every detail, unique in its kind. But is it possible to combine functionality and style in a single solution? The answer is yes". By using creative design lamps , you will ensure visibility and the lighting necessary for the passage are, and at the same time, you will introduce an original decorative element. Sisma is one of the suspension lamps in industrial style, made by Matteo Ugolini, of greater aesthetic presence. It offers continuously new lighting designs and at the same time guarantees excellent levels of task lighting. The metal rod structure makes this lighting design solution a decoration with an essential and sober appearance. The fundamental design steps just listed are also valid for the lighting of a hotel. Are you designing a restaurant's decorative lighting system? 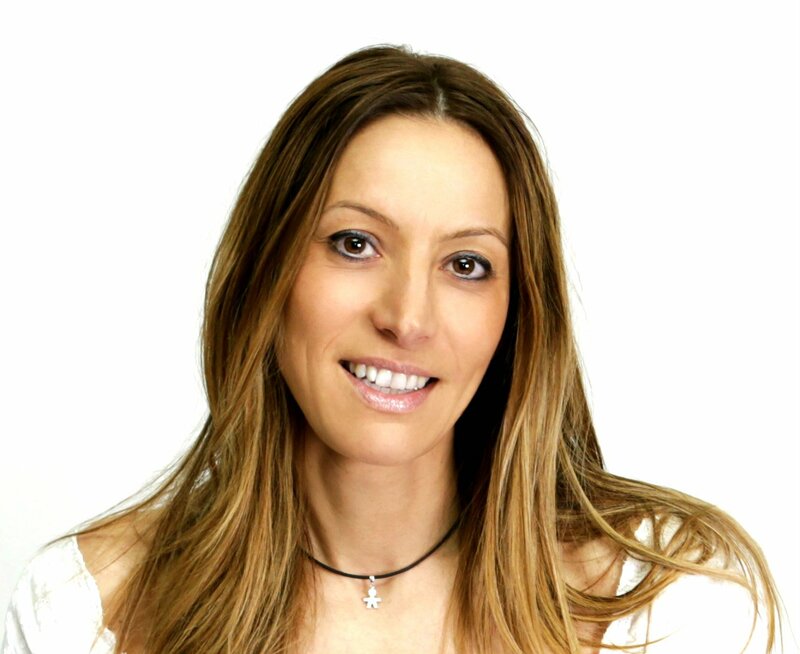 Also, in this case, our suggestions could help you in the realisation of the project. When it comes to developing lighting projects for houses and private homes, stairway lighting is often overshadowed. Light plays an important role in this place of passage because it guarantees comfort and safety at every move, both during the day and at night. The lighting of the internal staircase not only ensures smooth passageways and movements, but the choice of design solutions can also give character and elegance to this environment, without giving up the practical aspects inherent to its main function. In fact, designing a system of decorative lighting for the home means enhancing every area of the house with style while responding to its functional needs in each room. 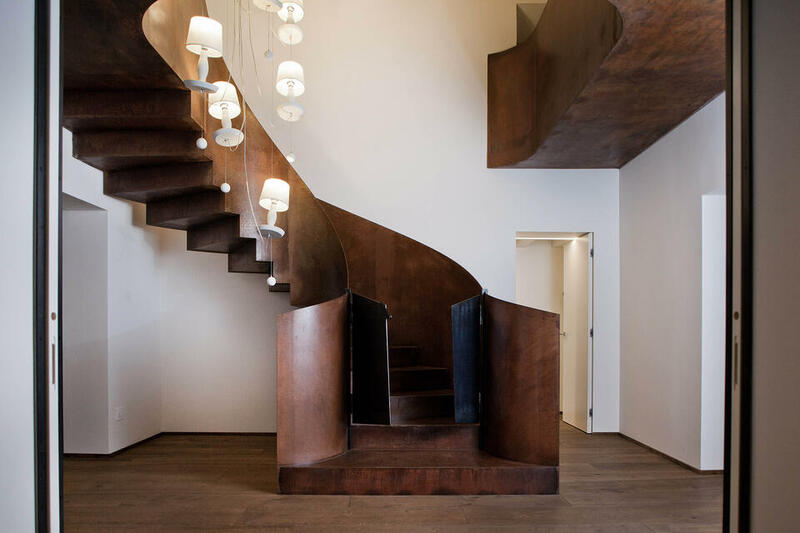 Follow our tips on how to illuminate an internal staircase correctly, step by step, and you will get a final result of high technical and stylistic quality. For more information, support and assistance in choosing the right models of lamps for lighting indoor stairways and passageways in private homes, do not hesitate to contact us at this link. We are at your complete disposal.